Ready to buy a new or pre-owned Cessna? 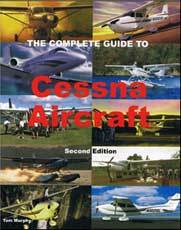 This is an updated second edition and includes (1) original in-depth info about older Cessna models (2) updated info on Cessnas being offered today and (3) buying advice on AD's, inspection of aircraft and its logbooks and how to choose the right model for your needs. Cessna A-37, AGcarryall, AGtruck, AGwagon, AT-17, C-17, C-120, C-140, C-150, C-152, C-170, C-172, C-175, C-177, C-180, C-182, C-185, C-190, C-195, C-205, C-206, C-208, C-210, C-310, C-401, C-402, C-404, C-411, C-414, C-421, C-425, C-441, DC-6, L-19, Model AW, 0-1, 0-2A, T-37, CJ2, Encore, Excel, Sovereign - plus many models of turbocharged and retractable Cessnas.